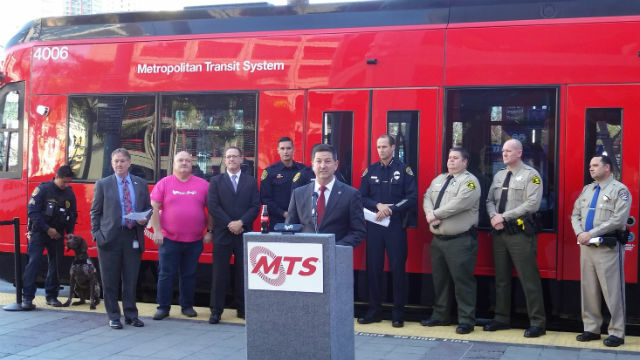 The Metropolitan Transit System will increase trolley frequency throughout New Year’s Eve and add special late night trains to help partiers avoid DUI. Speaking at a press conference Friday, Ward said the increase was prompted by two major events: the popular Holiday Bowl parade at 10 a.m. downtown and the following football game at 4 p.m. at SDCCU Stadium. To make the transit system more accessible, the transit agency is selling $5 all-day passes on New Year’s Eve. And for downtown partiers, Coca-Cola and Lyft are sponsoring special late-night trains, with the last leaving downtown after 2 a.m. on all three lines. “You’ve got several hours after the midnight hour to make your way home,” said Paul Jablonski, chief executive of the transit agency. He said the agency’s security personnel would be fully deployed during the holiday to protect transit riders. San Diego Police Chief David Nisleit said the special trains and rideshare services like Lyft would help San Diegans avoid a DUI arrest.